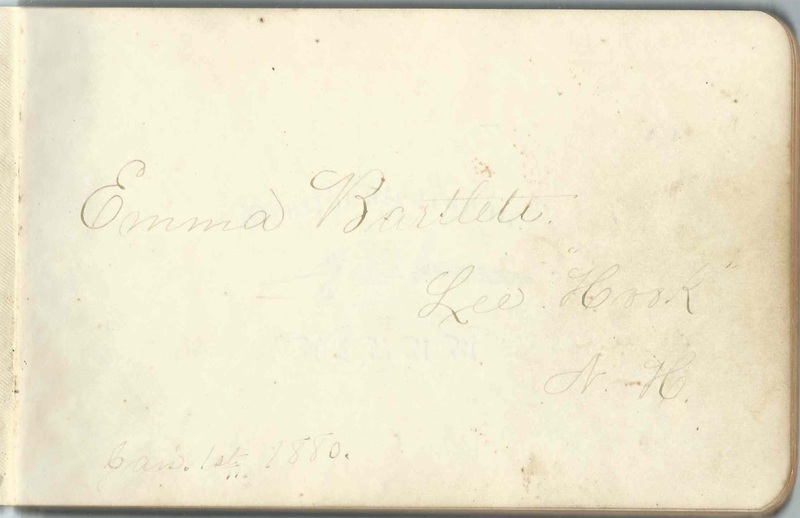 1880-1906 Autograph Album of Emma Bartlett of Lee Hook in Lee, New Hampshire. Many autographs were from her time either teaching or studying at the New England Conservatory of Music at Boston, Massachusetts. Other pages were signed by her pupils in New Hampshire. The album measures approximately 7-1/2" x 4-3/4" and contains the sentiments of over 100 of Emma's relatives, students, friends and, presumably, classmates. An alphabetical surname list and an alphabetical list of the signers, together with any personal information they offered, appear at the end of this post. The album, published by J. F. Walters and entitled the Ornithantographic Album, contains ten bird designs interspersed throughout; a few of the signers incorporated their sentiment and name into a design. Emma Bartlett was born about May 1858. the daughter, I think, of Edward St. John Bartlett and Almira F. (Sawyer) Bartlett. My uncertainty stems from a page signed by Leander Newton Sawyer of Salisbury, New Hampshire, who inscribed a page on October 27, 1887 at Lee, New Hampshire, and called Emma his "cousin by adoption". Was it Leander who was adopted or Emma? Or perhaps "adopted" was an incorrect term? Leander was the son, or adopted son, of Isaac Newton Sawyer and Betsy Jane L. (Hoitt) Sawyer. Hopefully a reader can shed light on this mystery. Emma had a older sister, Arianna Glidden Bartlett, who married Bradbury Bartlett Scales on May 29, 1877. 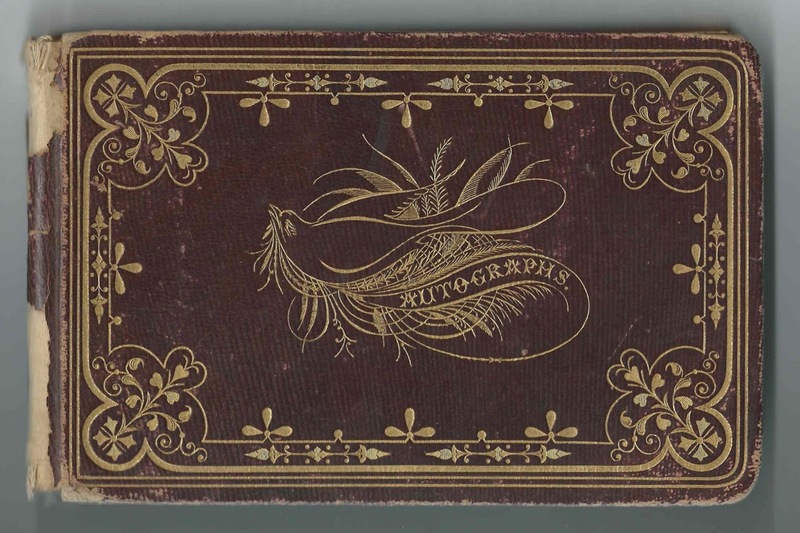 She inscribed a page in Emma's album at Nottingham Square, New Hampshire, on January 3, 1880. I don't believe Emma married or had children; she was with her widowed father and sister Arianna and Arianna's husband Bradbury Bartlett Scales at Exeter, New Hampshire, at the time of the 1910 Census, where she gave her occupation as private nurse. She may have given up teaching well before then. Though it's not an uncommon name, she may have been the Emma Bartlett, age 95, of Exeter, New Hampshire, mentioned in a 1953 issue of the Portsmouth Herald. I found a reference online to her death in 1959 at Brentwood, but I don't have confirmation on that. I'd love to think that she was the librarian at New London, New Hampshire, as this wonderful old photograph shows, but it's doubtful. E. W. This might not have been a person's name. Signed at New England Conservatory of Music in Room 240: a group page with names of Alice M. Mann; Helen S. Brigham; Carrie C. Spooner; Ilola L. D. Allen; and E.W. Ilola L. D. Allen of Scituate, Massachusetts [not sure of given name]. Signed at New England Conservatory of Music in Room 240: a group page with names of Alice M. Mann; Helen S. Brigham; Carrie C. Spooner; Ilola L. D. Allen; and E.W. Cora B. Angle of Stroudsburg, Pennsylvania, signed at Boston, Massachusetts, on June 27, 1885; presumably a student at New England Conservatory of Music. Alice Bridges of Ogden, Utah, signed at New England Conservatory of Music, Boston, Massachusetts, on March 4, 1885. She mentions the Inauguration of Cleveland. Helen S. Brigham of Fitchburg, Massachusetts, signed on January 11, 1885. Signed at New England Conservatory of Music in Room 240: a group page with names of Alice M. Mann; Helen S. Brigham; Carrie C. Spooner; Ilola L. D. Allen; and E.W. Ella F. Burleigh of Lee Hook, New Hampshire, signed on April 17, 1880; "Your ever true friend and neighbor"
Alice Burley of North Epping, New Hampshire, signed on December 7, 1883; Emma's pupil. Desire McG. Carver of Searsport, Maine, signed at New England Conservatory of Music, Boston, Massachusetts, on March 22, 1885. She was Desire McGilvery Carver. Her father, Isaac Carver, was a ship captain who had died at sea in 1866. Charles S. Chase of Boston, Massachusetts, signed at Salisbury, New Hampshire, on January 9, 1890; middle initial could be L rather than S.
Lizzie M. Choate of Boscawen, New Hampshire, signed on December 31, 1890. She wrote her name, only, with a mirror. When I held the page up to a mirror, her name jumped out clearly. Allie M. Day of Bangor, Maine, signed at New England Conservatory of Music on June 27, 1885; not sure of given name or middle initial, which could be a W.
Mattie E. S. Dow of North Epping, New Hampshire, signed on November 9, 1883. 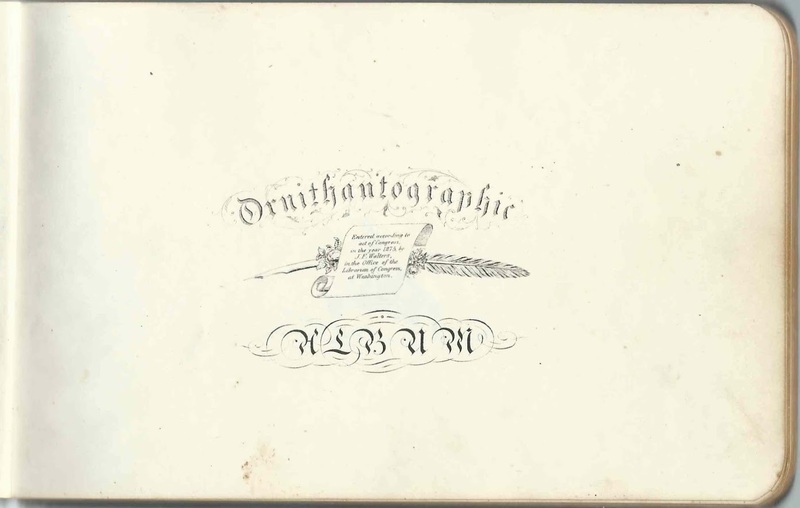 She was Martha E. (Sanborn) Dow, "Mattie", whose husband Frank Dow signed the right facing page. Frank Dow of North Epping, New Hampshire, signed on November 9, 1883. His wife, Martha E. (Sanborn) Dow, "Mattie", signed the left facing page. Phebe E. Hopkins of Wakefield, Massachusetts, signed on September 30, 1906. "Think of Polly"
Lulu Houdlette of Bath, Maine, signed at New England Conservatory of Music on November 18, 1885. Lucinda Houdlette. Miss Mira L. Jenkins of Kenduskeag, Maine, signed at New England Conservatory of Music in 1885. She was Almira Louise Jenkins, born 1862 at Pittsfield, Maine. J. W. Lees, signed on March 20, 1880. Presumably John Walter Lees, whose wife Hannah (Crombie) Lees) signed the following page. Hannah Lees of Lee, New Hampshire, signed on March 20, 1990. She was Hannah (Crombie) Lees, whose husband John Walter Lees, signed the preceding page. Alice M. Mann of Skowhegan, Maine, signed on January 11, 1885. Signed at New England Conservatory of Music in Room 240: a group page with names of Alice M. Mann; Helen S. Brigham; Carrie C. Spooner; Ilola L. D. Allen; and E.W. W. ? Rollins of Nottingham, New Hampshire, signed on November 6, 1887. Middle initial might be F; if so, presumably music teacher Wilber F. Rollins. 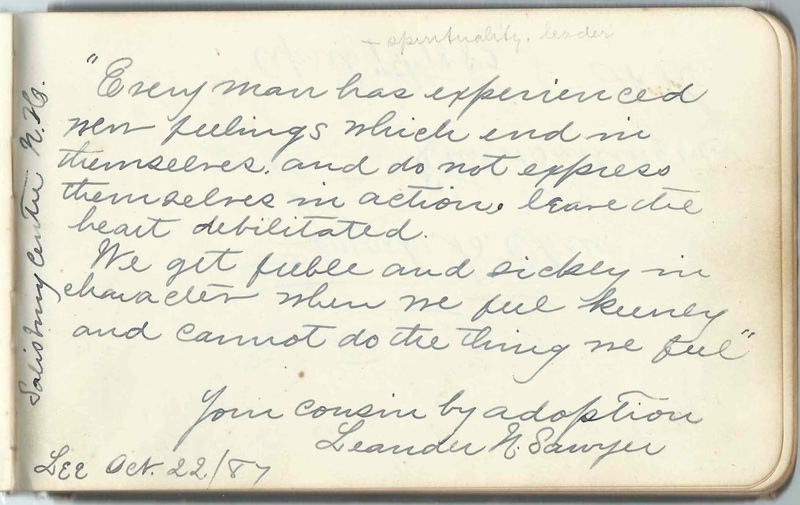 Leander N. Sawyer of Salisbury Center, New Hampshire, signed at Lee, New Hampshire, on October 22, 1887; "Your cousin by adoption". He was Leander Newton Sawyer, son of Isaac Newton Sawyer and Betsey Jane L. (Hoitt) Sawyer - unless they were his adoptive parents. Emma's mother was a Sawyer; perhaps she was the adopted one. 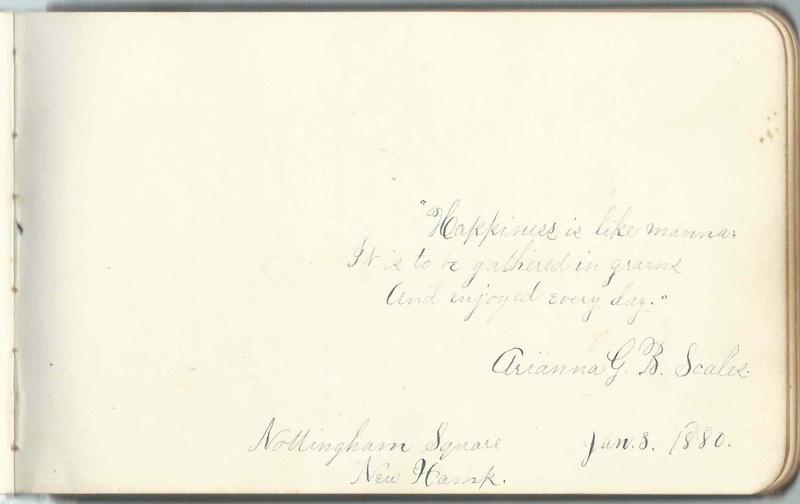 Arianna G. B. Scales, signed at Nottingham Square, New Hampshire, on January 3, 1880. She was Emma's sister, Arianna Glidden (Bartlett) Scales, who had married Bradbury Bartlett Scales on May 29, 1877 at Lee, New Hampshire. Carrie C. Spooner of Fitchburg, Massachusetts. Signed at New England Conservatory of Music in Room 240: a group page with names of Alice M. Mann; Helen S. Brigham; Carrie C. Spooner; Ilola L. D. Allen; and E.W. Edith I. Sutton of Odebolt, Iowa, signed at Boston, Massachusetts, on June 7, 1885, presumably a student at New England Conservatory of Music. Burt Thompson of Lee Hook, New Hampshire, signed on October 11, 1881; middle initial might be P. or F.
Isabel Waterhouse of Barrington, New Hampshire, signed on October 19, 1882. She was Emma's pupil.